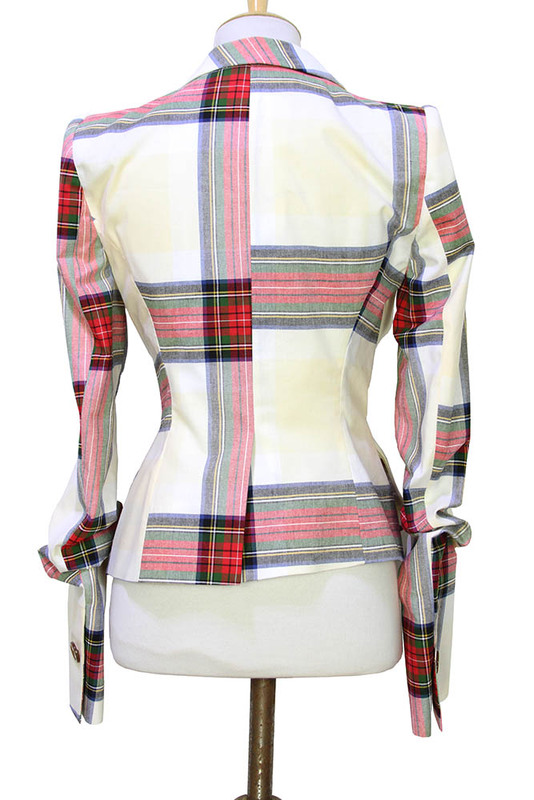 Vivienne Westwood Mainline 'Alcoholic' jacket, in Federal Tartan. Asymmetric shape, classic Vivienne Westwood. Off-white, blotched base colour with bold and faded tartan stripes. Padded Shoulders. This Jacket is designed with contorted seams and with voluminous fabric to the front and sleeves to form the classic Westwood drunken look. Finished with darting on the bust to accentuate the feminine shape. Left chest pocket. 2 side pockets. 3 button fastening. Single working button long cuffs. Single vent at the rear. Fully lined. This wonderful jacket matches other garments in the same fabric to create a stunning look!